Helicopter Ride - Lachute - 60 min - 1 to 3 pers. Location: Lachute airport on the North Shore of Montreal. This package good for one to 3 persons (The price shown is for the entire group). Maximum total combined weight of the passengers of 600 lbs. Each person must weigh under 250 lbs. 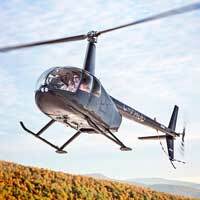 The Flight on a Robinson RH44 Helicopter. Take-off from Lachute Airport for a panoramic flight of the Ottawa River or the Laurentians region. Note: this package is available all year round but the flight cannnot be booked in July.